DONE! (whew!) 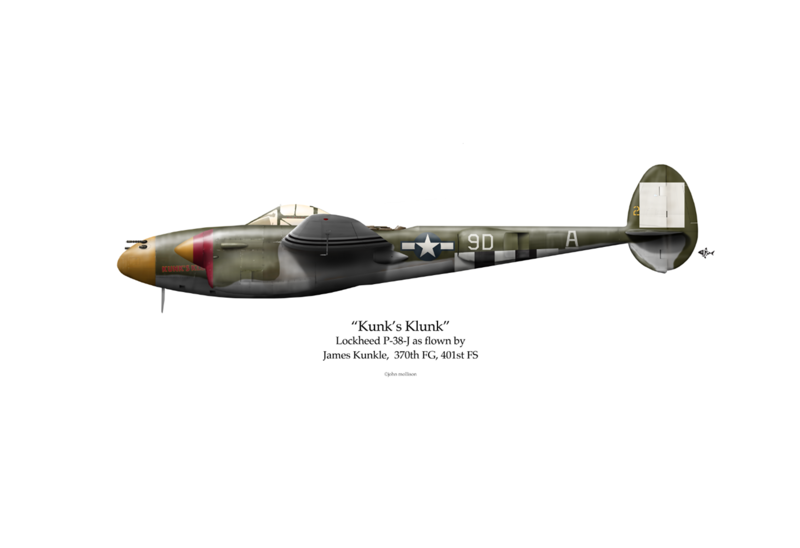 Presenting "Kunk's Klunk"—the P-38J as flown by James Kunkle, 370th FG. Take it in because in a few minutes, it's going to get blown to pieces. "BREAK! BREAK!" Jim hollered. "BREAK!" But there was no break. A few fruitless twists of knobs and flicking of switches made Jim realize that his radio was out! And being the last guy in the formation, any waggling of the wings was useless, especially with target just ahead...what's a guy to do? Jim hauled his P-38 into a tight left turn, climbing slightly, and rolling wings-level just as the onrushing gray swarm materialized into a formation of 20+ German fighters. Though alone and certainly outgunned, the initial merge favored Jim; the enemy's focus was broken, allowing the rest of the mission to put precious distance between itself and the attackers. 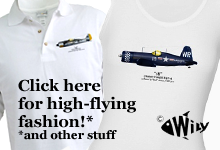 Go ahead and count the little Fw-190s. And then count Jim in the P-38. If you wonder how that works, imagine the scene as a school of fish disrupted by a stone. Instantly, the fish scatter. But these aerial "fish" were not minnows. Instead, they were piranhas. And Jim was no pebble. He was fresh meat. A few weeks ago, a severely disturbed man walked into an office with a weapon and started another damnable headline story. One died, another was injured. The toll might have higherl had it not been for a guy named Brian Roesler who jumped up to tackle the gunman. You can read about it here, but suffice it to state, Roesler's quote to the newspaper is interesting, "I didn't know what else to do." I thought that quote rather telling in that Brian actually had a number of options, many of which would have been reasonable, if not "smart." But instead, he thought to act as he did and in so doing, probably saved a few lives. The dogfight was intense. In quick succession, the Germans snapped-to and pointed their noses at the odd-shaped American in their midst. This was going to be an easy kill. Kunkle, in the swarm, was able to unleash his four .50 caliber machine guns and 20mm cannon against the targets that flashed past his nose. Boom! chakachakachakachaka Boom! chakachackachaka Boom! In the whirl of g-forces, Jim managed to knock one, then two Germans out of the sky. I asked the—now that I think about it—ridiculous question, "So tell me the details behind the two you shot down!" My question was met by a warm chuckle as Jim replied, "Really?!" Another laugh. "I'm afraid I was a little preoccupied to remember those details!" However, there were some memories of that combat that simply couldn't be forgotten. "I remember my left wing. A one-ninety was behind and to my left and he walked his bullets right up the wing towards (the cockpit). The airplane shook and then fire blasted out the cold-air vent, down by my leg and up towards my face. The flames shot out like a blow torch." "Not quite sure. The airplane blew up. My next memory is falling face-down through a cloud." I took no joy in doodling this scene. Other than that Jim made it out. The combat had taken place about seven, maybe eight thousand feet. Jim remembered the cloud deck was around five thousand, so he'd fallen at least half a mile, buffeted by the wind and pained by the peeling of burned flesh from hands and face. Miraculously, he had enough presence of mind to grasp the "D-ring" of the parachute release and tug it open. Parachutes don't float people to the ground like a feather. They simply reduce the speed of falling to the point to where a human can survive the impact. Approaching earth at approximately 22 feet per second, Jim's fall wasn't the elegant descent of today's sky divers. If you want to get an idea of what Jim went through, climb up onto the highest peak (or 22', whichever comes first) of your roof and jump. But, it didn't hurt quite as bad as it could have because luck would have it that Jim's parachute snagged a proudly standing tree, smack-dab in the middle of a European courtyard. With the same force as coasting a bicycle into a brick wall, he strained to a wood-crackling halt, hung for a moment, then released himself to fall the few remaining feet to earth. My cheesy map. 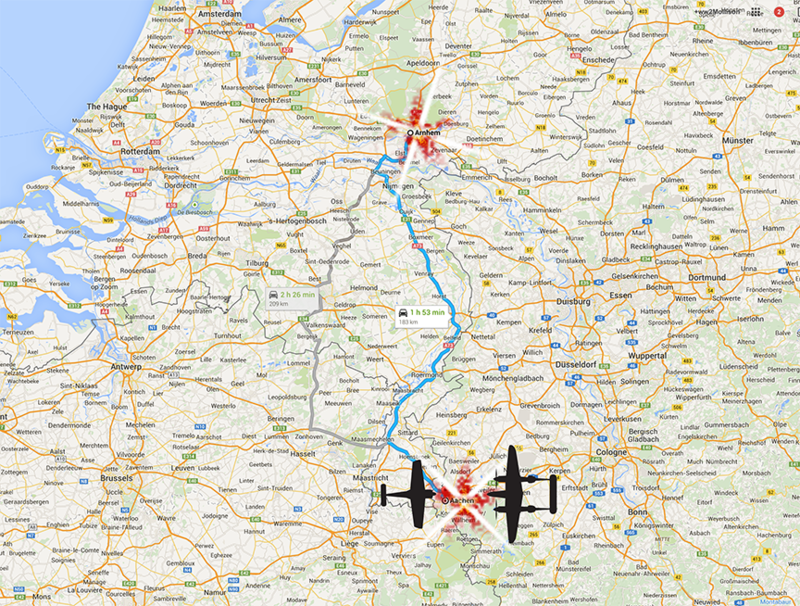 Kunkle was a few short minutes (flight-time) from one of the greatest battles of WWII. In case you're not up on WW2 history, there are two things of significance about Aachen at the time. For one, some 80 miles to the north, the British were a day away from their oddly-planned* parachute assault called, "Operation Market Garden." Ever hear of the movie "A Bridge Too Far"? That. For two, the American Army had just crossed the Rhine river and had advanced into the Aachen area. History geeks will remember Aachen as the first German city to be liberated. But that event was over a month of bloody days away. Putting it all together, on September 16, 1944, Jim had gone from frying pan into fire. You can imagine the scene—a quiet courtyard, waning Fall afternoon (1745hrs to be exact) , the gentle crunch of flat-soled shoes on cobblestones and somewhere off in the distance, the spastic crackle of rifle fire...Jim ran for cover. It was then that adrenalin's effects, having protected Jim from the worst, began to subside, allowing the searing pain a chance to inform Jim that he'd been hurt. Badly. "I made my way out of the courtyard and onto a road. A county road. My eyes were swelling shut (from the burns) and I knew I had to get help. But I knew the Germans were there (too). Down the road, along a hedgerow, I was able to make out some soldiers. They had netting in their helmets and, thought, Americans! Wow!" Those Americans were from the 1st Infantry Division. Every hear of the movie, "The Big Red One"? The 1st had just arrived into Germany and the timing couldn't have been better. Not only had they entered Hitler's backyard, they also had a grunt's-eye view of the show overhead. 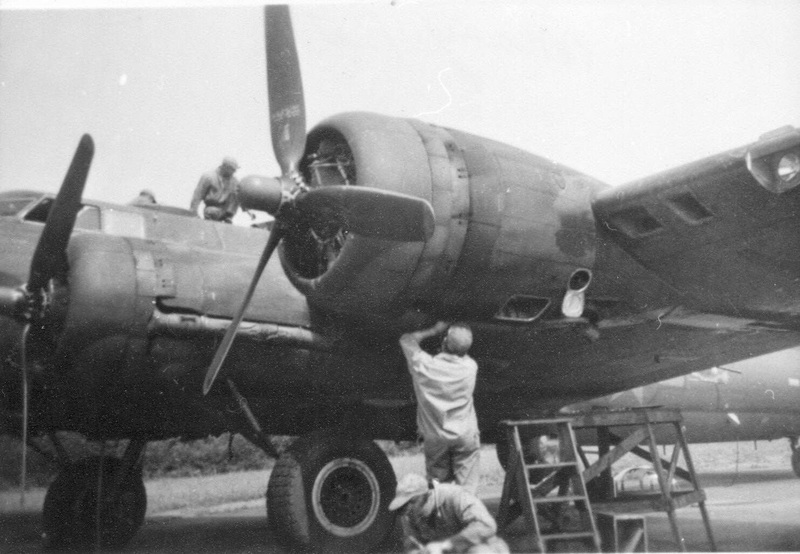 The ground-bound eyewitnesses are why we know there were 20+ Germans versus Jim's lone P-38. 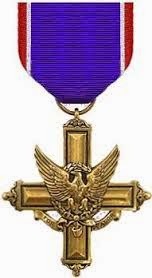 While Jim recovered in a Paris hospital, the Army and the Air Force got together and managed to get the man awarded the Distinguished Service Cross for his effort. Jim had put on a heck of a show for the infantry beneath. The President of the United States of America, authorized by Act of Congress, July 9, 1918, takes pleasure in presenting the Distinguished Service Cross to Second Lieutenant (Air Corps) James K. Kunkle (ASN: 0-763232), United States Army Air Forces, for extraordinary heroism in connection with military operations against an armed enemy while serving as Pilot of a P-38 Fighter Airplane in the 401st Fighter Squadron, 370th Fighter Group, NINTH Air Force, in aerial combat against enemy forces on 16 September 1944, during an air mission over Aachen, Germany. On this date, while flying as rear man in a squadron on an armed reconnaissance mission, Lieutenant Kunkle noticed that his squadron was about to be surprised by a vastly superior force of enemy aircraft. 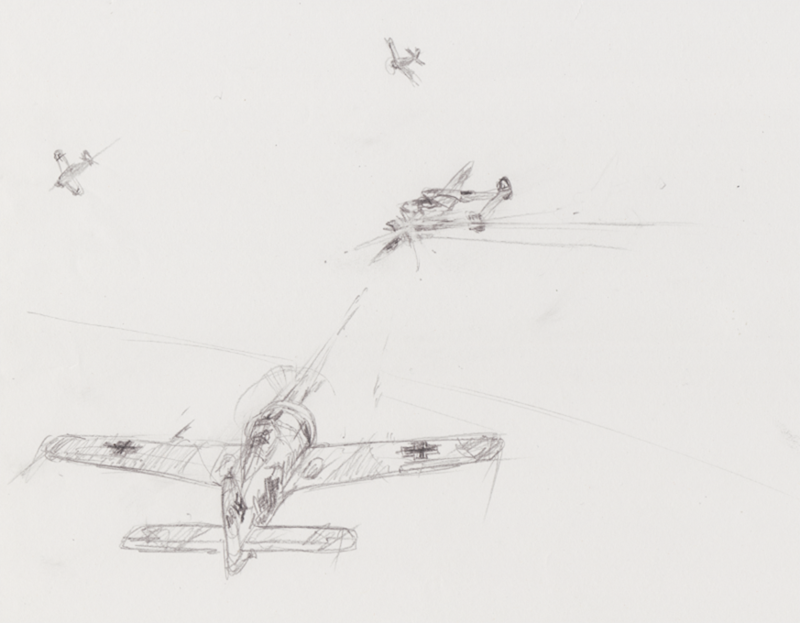 Unable to summon his leader on the radio, he alone unhesitatingly pulled away from his formation and vigorously attacked the enemy, immediately destroying one of his aircraft. In so doing, Lieutenant Kunkle placed himself in a position to be attacked from the rear and above. 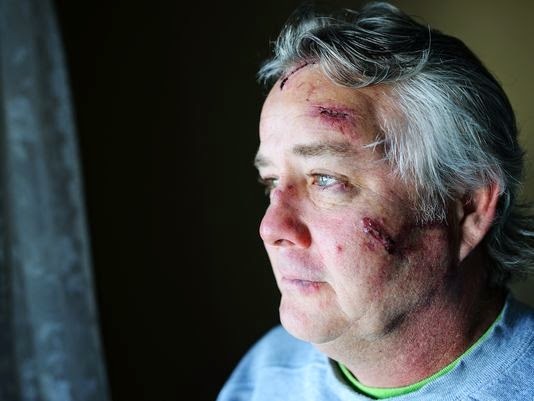 When this attack materialized, many hits were registered on his aircraft which caught fire burning his face, neck, and hands. Despite his burning plane and the gunfire from enemy planes, Lieutenant Kunkle continued his attack against the vastly superior enemy force and succeeded in destroying a second enemy aircraft, breaking off combat only when forced to parachute to safety when his left fuel tank exploded. Second Lieutenant Kunkle's unquestionable valor in aerial combat is in keeping with the highest traditions of the military service and reflects great credit upon himself, the 9th Air Force, and the United States Army Air Forces. In case you're wondering, the DSC is one stop below the Medal of Honor. So, knowing that, would you have another look at Kunk's Klunk and give the poor girl a moment of silence...? "So what happened to Jim?!" you ask. Good question. After 16 weeks of hospital care, Jim tried to get back into combat but a doctor discovered additional spinal injury and took him right out of flight duty. The war was over. Instead, the Doc sent Jim to what was called a "Flak House" for 30 days of peace, quiet and a chance to heal. In case you're not familiar with the term "Flak House," it was a slang name for a the kind of convalescence that only those who've experienced mortal combat can appreciate. Jim described it as a beautiful English Manor populated by, of all people, bomber crew. "I was a fighter pilot. I wanted to talk about flying. 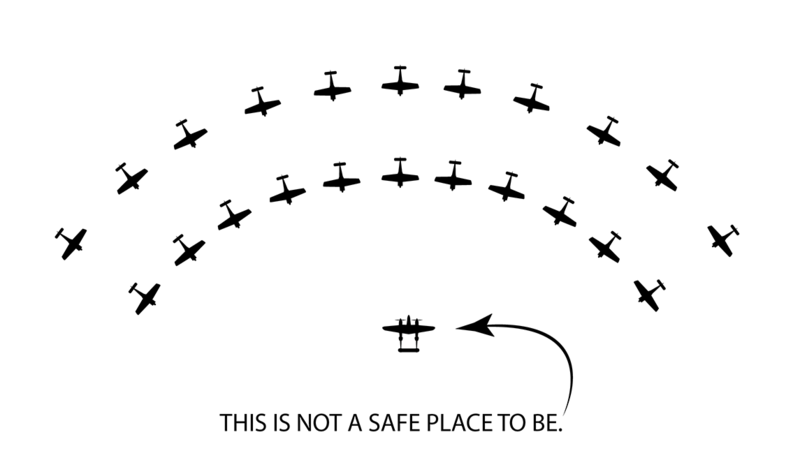 About airplanes. About..." Jim's voice trailed for a moment. "But the bomber crew? They wanted none of that!" We talked for a few more minutes on the strange blessing that being (seemingly) in-control of one's fate could be to a man. The bomber crew had to grit and bear the random pierces of flak and the slashes of the Luftwaffe. But the fighter pilot, though inter-dependent, was more self-reliant. Somehow, someway, to Jim at least, that formula worked best. "Over the years, I can't count all the great leaders and good role models I've had. Especially in the military. But my mother, she was my guiding light. ** And you know, I still meet people I look up to! But I've always been, ultimately, in charge of myself. I may be part of a team, but I am (foremost) an individual." Jim went on to explain that opportunities abound in spite of pendulum swings of the economy, of politics, of this or that...but only to those who have the sense of personal responsibility to account for their fates. And only to those willing to take on 1:20 odds. After all, he didn't know what else to do. "Kunk" signing my artwork. Check out Jim's office decor. And his buddy. Now. 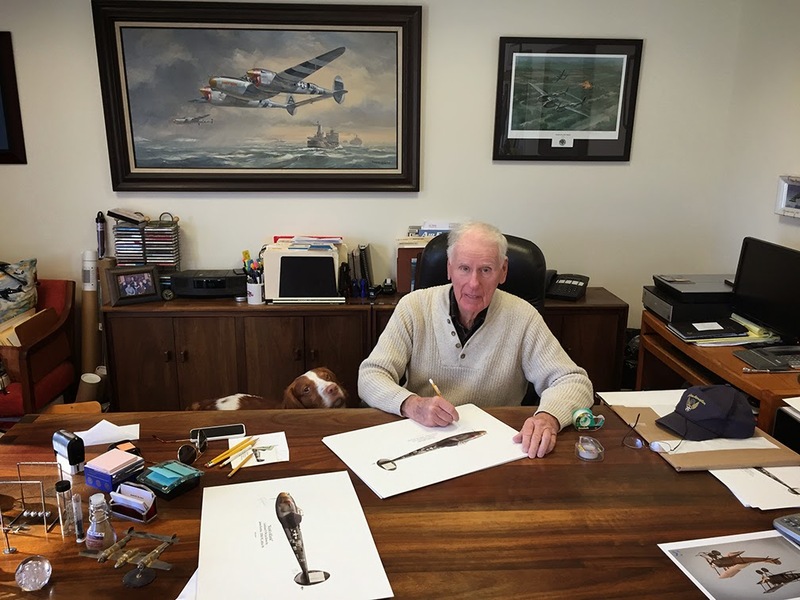 If you'd like to own a print of "Kunk's Klunk," signed by the boss himself, click here and scroll down until you see his P-38. *I'm being charitable. "Market Garden" was a dumb idea. So dumb, it should be a lesson plan in business schools for young executives who hope to do things like start businesses, manage people, or develop new products. It'll scare'em silly. Don't believe me? Read this. *Jim's dad died while Jim was a young boy. Jim's father had been an aviator in WWI and was a primary force in interesting the young Kunkle in all-things aviation. A salute goes to both parents. In case you haven't been following this story, Pave Knife was the amazingly successful laser-guided weapons system used in the last year of the Vietnam War. Though it wasn't the first* (Pave Way was) Pave Knife was certainly the best. It's worth its own post because of its game-changing effects on everything from tactics to weapons procurement to, some say, even shortening the duration of the Vietnam War itself. If you ask me, its enough that Pave Knife was a brilliant case of teamwork between the military and private enterprise. From concept to in-country, the development of the Pave Knife system set records in terms of production and economy. In case you're curious, the contract for designing and building the thing was a "fixed price." Meaning, no chance for budget over-runs or cost obfuscation. 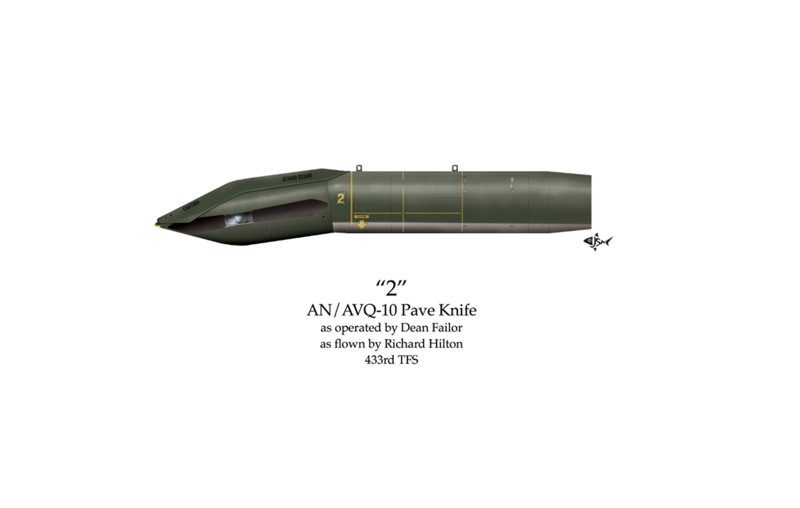 And since the pressure was on to deliver accurate munitions with minimal collateral and "political" damage, time was of the essence; Pave Knife went from idea to working device in approximately nine months and in-country in less than twelve. Of course, with such short notice, not many of the things were built. Each one was "hand crafted" and the total number that the USAF used in Vietnam was small. Although a couple sources say there were seven, the number was most likely only six. But even that paltry number quickly whittled down to three or four due to operational loses and the wear and tear of hard use. The photo below shows #2, the model that I used to create the illustration. No idea who took this picture. It's been retouched but I wonder why?! In case the mere-months time frame doesn't mean anything to you, it'd be like going from empty lot to unloading the moving truck in...like...a week. 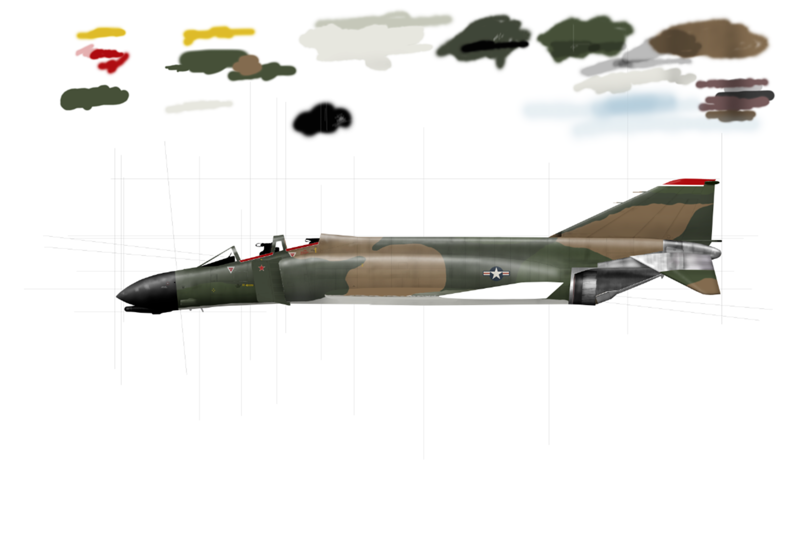 From here on out, I'm going to be concentrating on drawing one of the F-4s that carried the Pave Knife into combat. However, bear with me for just a few more minutes because the gizmo deserves a bit more explanation on how it works because the rest, as my kids say, gets complicated. The Pave Knife is actually not just the device above. "Pave Knife" is actually a weapons system, meaning it requires the co-functioning of separate units to perform its work. The first part of the Pave Knife system is the bomb. Have a look at the little animation below. 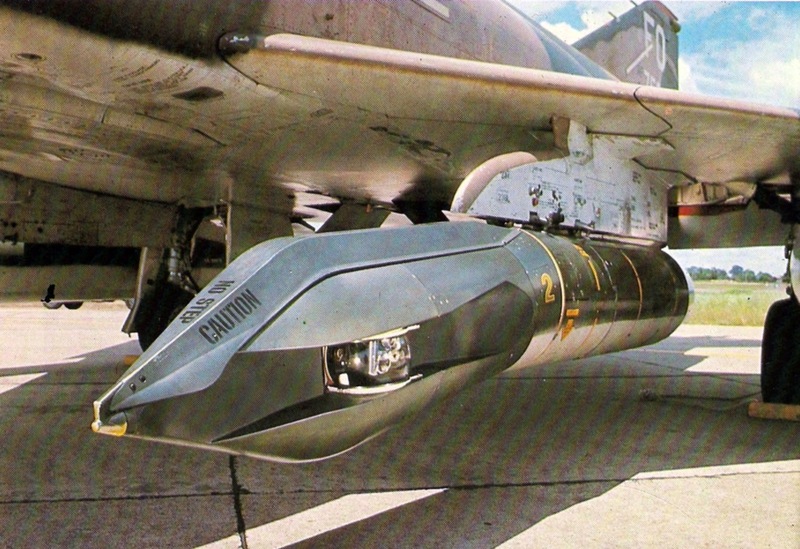 The main body of the bomb is a standard "Mark 84" 2,000lb General Purpose bomb. However, the fins have been enlarged in the rear and a "seeker head" installed on the front. In my animation, the seeker head looks like a small rocket stuck on the bomb nose. Anyway, the tip of the head swivels and pivots. In the nose, there's an 'eye' that detects the reflection of laser light and sends signals to the set of fins just aft. Those fins are moving fast because in real life, they acted just as you're seeing them - bang! bang! The fins didn't steer by subtle degrees but by making full-deflection 'bangs' to keep the eye pointed toward the target at the rate of up to ten per second! Of course, since the bomb relied on gravity to provide motion through space, (as opposed to a rocket that could be propelled) lateral deviation from the bomb's trajectory was dictated by altitude and airspeed. A laser-guided bomb (LGB) couldn't "fly" much beyond the flight path. But having a bomb that could be steered like a radio-control airplane wasn't the point of the Pave Knife system. Dialing in absolute accuracy was. 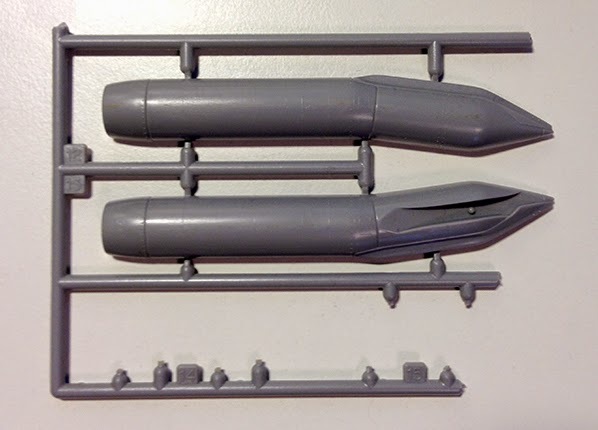 Parts for a plastic Pave Knife model. Over the years I've learned to trust the good folks at Hasegawa models to be accurate. And, I've also learned to trust the good folks who follow my work. This little guy was given to me by a reader who heard my cry for reference material. And boy was it accurate. In combat tests, over 50% of LGB bombs were dropped on-target. Not 'sorta' on-target. No 'close enough' on-target. We're talkin' down to the pin-point on target! The remaining 50% (unless something got fubar'd) were within a yardstick's distance. So, consider that we're talking about a 2,000b bomb, "accuracy" is pretty much academic. Putting this into perspective, consider a typical WW2 Navy dive bomber would deliver 50% of its bombs within a 100' diameter circle. So, it's rather easy to see how Pave Knife absolutely changed the rules of bombing. Ok, have a look at the animation below. It's my attempt at putting it into practice. For illustrative purposes only. In real life, the bombing F-4 would be coming right down the bridge line; I offset it for illustrative purposes. The F-4 at left has just released its bomb (seek the little black speck?) around 7k-10k feet. The F-4 at right, at about 10k-12k feet, is projecting a laser beam from the wing-mounted Pod onto a specific point on thebridge. You can see how the two parts, bomb and Pave Knife pod, worked together. 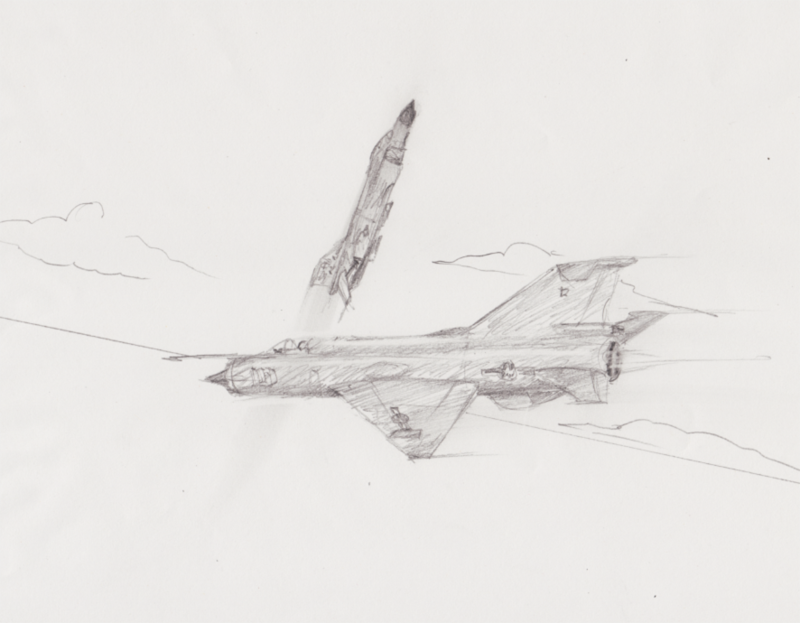 Well, I have to start drawing an F-4D so this little drawing can do some good. It's going to take a while because I've got a ton more research to do. Believe it or not, due to the kindness of a long-time reader, I've managed to acquire a book of BDAs (bomb-damage assessments) of Pave Knife missions from May, June and July of 1972. My idea is to pick a particular mission (I'm thinking against a bridge target) and analyze it. In the process, I will confer with Dean Failor (one of the trained Pave Knife operators) and a pilot who took the device "up north." Dean's been introduced here before. So, it's a good time to introduce you to "Rick" Hilton, Squadron Commander of the 433rd TFS. *Pave Way and Pave Knife were equally accurate systems but Pave Knife was far better for combat for a number of reasons that will be explained later. "(I) thought I was going to the big show. Vietnam. (But) wound up in the Philippines (and) thought I had missed the action." In the meantime, much to Jim's chagrin, I'd like you to focus on the red star painted on the splitter-plate. Why chagrin? It’s because the particular F-4 that I’m drawing is also the F-4 that Jim and Mike Vahue flew when he downed a MiG-21 over North Vietnam. Jim has let me know—on a number of occasions—that the story that follows neither makes him a celebrity, something special or particularly better than anyone else in the unit. Instead, that it happened at all was, in his words, "luck." On April 16, 1972, Jim and Mike got…lucky. The day before, the pilots of the 523rd were told that the USAF would be going into North Vietnam for the first time since 1968. The squadron’s particular roles in the operation were two-fold: one, to provide MiGCAP (protect the bombers from MiGs) and two, Air Defense Alert (wait around for a "scramble!"). Jim and Mike, on account of rank (they were mere Captains) were told they wouldn't be a part of the MiGCAP show up North and to wait it out in the lounge. Mental picture: two guys in green flight suits, white paper cups topped off with mediocre coffee, feet up on a chair and snapping open the paper. "(You) train for something, you want to do it! We were on 15-minute alert which means that we're part of two airplanes that are a backup to the planes on 5-minute alert. But, just before the main strike takes off, the two planes on 5-minute were scrambled to check the weather." But, about 0930—45 minutes after the main strike had been launched—the remaining Alert F-4s were scrambled. In a scene out of the movie Battle of Britain, Jim and Mike, along with another F-4 crew lead by Gary Lorenz, bolted to their...nothing! In the preparation for the strike mission, the airplane Gary had been assigned was used to fill a slot in the main strike force. "So Gary goes off looking for another F-4!" Mental picture: two frustrated guys in green flight suits wandering around a shopping mall parking lot looking for their car. However, after twenty or so minutes of phone calls, frustrated pleas and I'm sure a few swear words, another F-4 was found. Finally, some thirty minutes later, "wheels up" from Udorn AFB occurred and the two F-4s bolted north towards Laos for what was sure to be a waste of time. By then, the main strike was on its way back home and the show over. 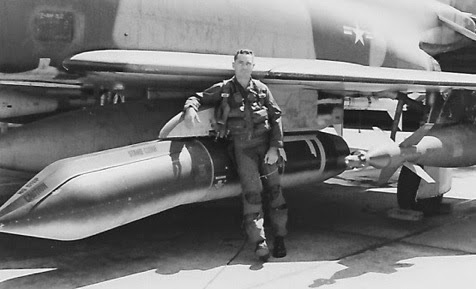 However, once on point over northern Laos, the two F-4s got the call that made Jim and Gary tighten and clench—"Papa 3 flight, we hold blue bandits zero six seven degrees, seventy miles from you at nineteen thousand, supersonic." 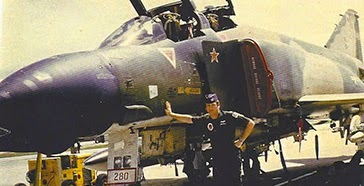 As a believer that "Luck" favors the prepared, Jim turned the flight to face the threat, and readied his F-4 for combat that he still doubted might ever come. An F-4D cockpit. A multi-tasker's heaven. "(So) we blow off centerline tank. At 35 miles (from the target) we then blow off outboard tanks. I had already determined that if I ever get the chance to engage MiGs, I would tune missiles1 and go into engagement missiles tuned and armed. I had seen guys miss shots because they were late getting ready. The GCI which were Navy cruisers off shore of N.V. Nam,some 120 miles away keep giving us info on bogies. At 35 miles I ask if bogies are declared hostile! (And the) answer? YES! Heavy breathing starts! Now they are bandits!" At about 19 miles, my wingman calls he has contact (and) GCI confirms that they’re our bandits. I tell him he has lead and is cleared to fire, which he does, but nothing happens! (I) find out later that Gary fired but no missiles leave his aircraft.2 Confusion now ensues. GCI calls and says we are merged with bandits...and we don't have a tally3 on the bad guys. I call for a split-S4 but Gary doesn't hear the call. You following this? Good. So let’s take a break for second as a little context is in order. In comparsion against the knife-edged duels from WWI or the more calculated tactics of WWII, the aerial engagements over Vietnam were far more complicated. Because of the speeds, distances and “rules of engagement,” both the USAF/Navy and VPAF relied on outside help (i.e. GCI5) technology, (i.e. missiles and their guidance systems) in addition to old-fashioned flying. Mental picture: think about it this way—in the 1940s, you bought a car and drove. That’s like flying a Fokker Dr.1 or Sopwith Camel. Dogfighting is visceral and simple—maneuver, shoot. In the 1970s, you bought a car, drove and listened to the radio. That’s like flying a Spitfire or P-51—still fairly straightforward but the increased speeds and innovations allow for new tactics; Today, you buy a car, drive, synch your telephone so you can listen to satellite radio, navigate with a GPS and dictate your email. That’s like the F-4 vs. MiG-21 duels—GCI, radars, guided missiles, rapid speeds and “rules of engagement” in addition to flying the airplane. Null was an hour away from home at 300mph. Or, about 15 minutes balls-out. Ok, getting back to the two Phantoms burning eastward towards the blips on their radar screens, we’ll pick this up when Jim realizes that the MiGs have now “merged” with the F-4s. In short, it’s on! Ok, hold that thought for a second. The MiG-21 was designed out of Cold War thinking that ‘dogfighting’ was a thing of the past. MiG-21s were made to go fast, fire missiles then run home for more fuel and missiles. Though comparatively maneuverable, the MiG-21 lacked the crucial quality that all good dogfighting aircraft need: good visibility for the pilot. Check the photos below; I took these of a MiG-21 in Hanoi. You can see that the cockpit is so streamlined into the fuselage, it's as if the engineers were doing everything they could to keep the pilot from getting distracted by anything behind. “I started a climb. With a clean F-46, low altitude, I'm sure I was above the (speed of sound) as I started my climb. I aimed at the lead MiG (black)7 and passed off of his right wing going straight up. I definitely ID'ed him as a MiG. I could see the pilot, the pitot tube coming out above the intake...I had to be inside 100 yards of him. I continued up and waited until the silver wingman to pass then I pulled down to follow. I was low at the 6 o'clock of the trailing MiG (silver). the orientation right. And I haven't figured how to draw black airplanes with a pencil yet. We achieved a lock on, waited the necessary 4 seconds8 and fired an AIM-7. I had fired an AIM-7 at Clark AB with the Test Squadron and knew what to expect. The missile departed the aircraft—I could feel the launch mechanism function—but no rocket engine ignition with accompanying roar. I thought I had screwed up! I quickly checked my switches. Everything looked good so I fired again. The second missile came off, rocket fired and the missile appeared to be tracking. I decided to ‘up’ the probability of kill so I fired my 3rd missile. (That one) appeared to track for a while but then it took off up and to the right and exploded harmlessly in the sky. (But) then I turned my attention to the second missile. It pulled up to the left wing of the (silver) MiG, exploded and the expanding ring warhead took the tail off of the MiG. I saw the tail spinning off to the right and pieces of the missile exploding off to the left. The MiG appeared to be un-phased and continued on. I'm sure it was only for an instant but it seemed much longer. It suddenly pitched nose up and had a large plume of fire coming from the tail. We were close by this time and pulled up and to the right of the MiG. We banked to the left to keep the MiG in sight. The MiG rolled upright one last time, the silver skin gleaming in the sun. I could see the markings on the wings and the canopy was still in place. It then rolled inverted for likely the last time as we were only about 3000 feet or less and the MiG 2-300 feet below us. ©James Null. Invaluable photo in finishing out the 523rd's bird, too. And that, thanks to Mr. Null, is how MiG-hunting was done, April 16, 1972. Anyway, like I wrote at the beginning, I’ll post the 523rd’s finished F-4 here in April. If you’re curious, there are no plans to offer signed prints for sale, though I do look forward to hanging my Squadron-signed copy in my man-cave. And those promised F-4 photos? DEFINITELY worth the wait. You will like them. 1The system that acquired a target and gave the scent-signal to the missile’s seeker-head was complicated and needed a bit of man-handling by the pilot, not unlike a crappy clock radio dial that squawks its way to find a nice, clear signal. 2Missiles in Vietnam were notoriously unreliable. AIM-9 Sidewinders were the best performing missile with an aggregate success rate of about 18%. At extreme close range (less than 1,000 feet) Sidewinders did a better job, hitting their target 86% of the time. But you can see by the disparity of average-numbers how rarely those close ranges occurred. AIM-7 Sparrows, like the one that Jim used, were a longer-ranged missile that could acquire a target moving away, towards and obliquely. However, that target acquisition required an uninterrupted signal between the F-4 and the missile and that meant the F-4 was not completely free to maneuver. Regardless, it’s success rate was only about 10%, hence Jim’s firing of multiple missiles. Gary's unfortunate moment where all four of his Sparrows failed is at once astonishing and unremarkable. AIM-4 Falcons were the least liked missile. Though its success rate was on-par with the Sparrow, it required the longest time for the missile to acquire the target and required the most pre-launch inputs from the pilot. It’s rumored that pilots would rather dump their AIM-4s under some other pretense (as in damage due to flying through a thunderstorm) than bring them back to bother someone else another day. 3”Tally” comes from the English hunting cry of “Tally ho!” when contact with prey was sighted. 4Split-S is a manuever in which the airplane reverses direction via a snap roll and dive. Significant altitude is lost but the aircraft gains airspeed and a completely new direction, quickly. 5GCI = Ground Control Intercept. Whether in a little dark room in a hidden bunker or a little dark room in an airborne command center, “GCI” are the people and tech that identify/confirm targets and relay the information to the pilots. 6”Clean” means Jim’s F-4 was stripped of heavy, maneuverability-sucking weight like drop-tanks. 7MiG-21s came in all colors. Most of them were silver, a few of them were dappled green, some dappled green and brown, some brown…and as Jim saw first-hand, black (or at least extremely dark). These were suspected to be MiG-21s designated for night-flying duty. I’m checking in with my VN sources to verify this but suffice it to state, it’d be wicked-cool to do a black MiG-21 and talk to one of the pilots. 84 seconds was what it took to transfer information to the missile before launch. Remember, these where information was transmitted "analog" fashion versus today's "digital" fashion. There is not enough room here to describe in detail but it's like comparing magnetic tape sound-recording versus how an MP3 file is created today. 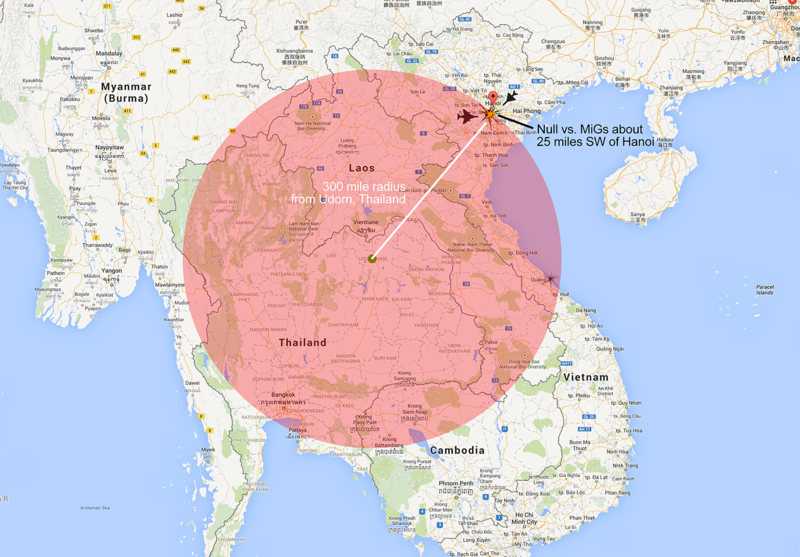 Vietnam-era missiles relied on technology that, in comparison to today, is Cro-magnon. People always ask, "How do you get your stories?!" "I'm sorry I had to cancel our meeting last week. My dad was in town and I wanted to see him." "No biggie! How's he doin'?" "He's great! Especially for a 94 year old." (antenna pops up at mention of age) "He still drives, still does everything himself. But he's starting to slow down." "Oh yeah. Big time. He was a Crew Chief." "England. 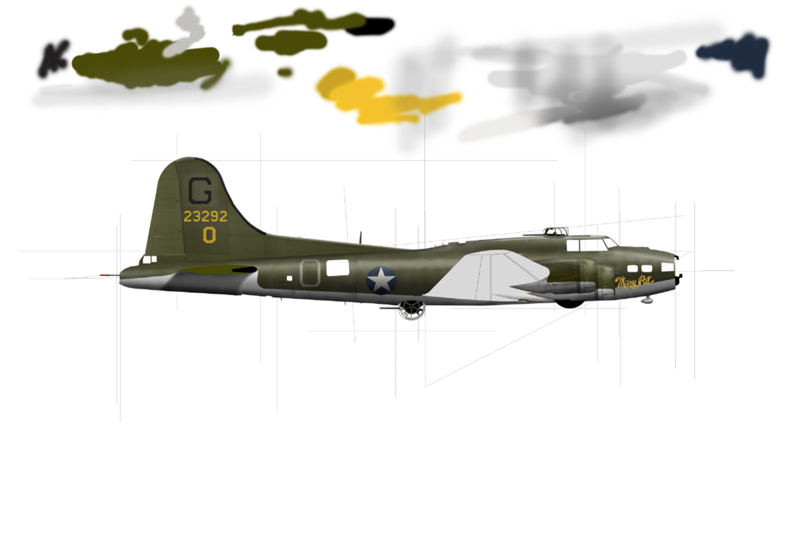 He worked on B-17s." "Why? You want to meet him?" Anyway, have another look at Mary Pat above. I guess I'll be meeting her Crew Chief and of course, will post all the details here. :) Stand by! That'd be S/Sgt John DeBerg working on "his" engine.